Get in touch here, we'll get back to you right away. CFIH has a clinic in central Brisbane, and in Buddina on the Sunshine Coast. Refer a client to us here with our online referral form. You can catch the train to Central station, and take the walkway to Wickham Terrace. Silverton Place is across the road. Spring Hill Bus Loop. This is a free service operating on a continuous circuit between the CBD and Spring Hill precincts. Popular stops include Brisbane Private Hospital and Central Station. Click here for more information about this free service. On street: There is limited metered parking available on Wickham Terrace or Astor Terrace (the street behind Silverton Place). We have parking vouchers available for the secure carpark located at 28 Astor Terrace. These vouchers can be collected from our reception desk at the end of your appointment. Our reception team can provide more information on using the vouchers at the time of your appointment. Astor Terrace: Enter via Cousins Lane off Astor Terrace. From Astor Tce Carpark you're able to cut through to Silverton Place and Wickham Terrace. 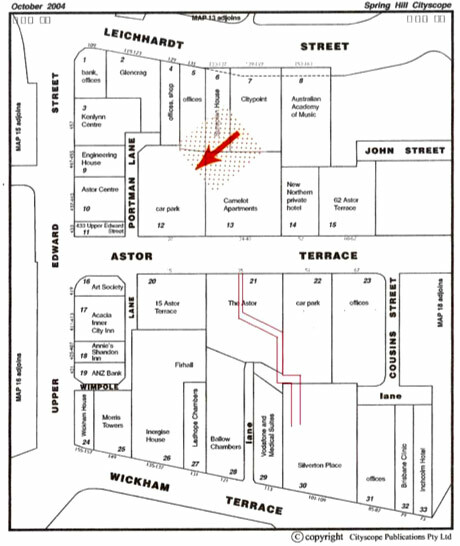 28 Astor Terrace: Turn into Portman Lane off Astor Terrace (near BOQ). Novo Hotel Parking: Enter via Cousins Lane off Astor Terrace. United Services Club, Upper Edward St: On Upper Edward Street at the end of Astor Terrace, diagonally to the left of the lights. Brisbane City Council car park: Located on Wickham Terrace. Access via Turbot Street or Creek Street (exit only from Wickham Terrace). For patients with disabilities, there are two disabled car parks out the front of the building, on Wickham Terrace. Otherwise, we suggest the Wickham Terrace car park, as all the other car parks involve flights of stairs. Alternatively, you may catch the train to central station, which is directly opposite Silverton Place and has a wheelchair lift. Plenty of on-street parking is available. There is also free parking in the public carpark situated across the road at both the Buddina shopping centre and the beach.